Get ready for combat as you challenge your opponent to the ultimate Boot Camp Challenge! What tactics will you use when you jump through your first hole and squeeze through the inflated pillars only to be met up with hedgehogs? You better have upper body strength to grab the rope and swing to the other side, or whoops… you’ll get wet! As you go through the vertical pillars, watch out… Lazer Beams! Are you tired yet? 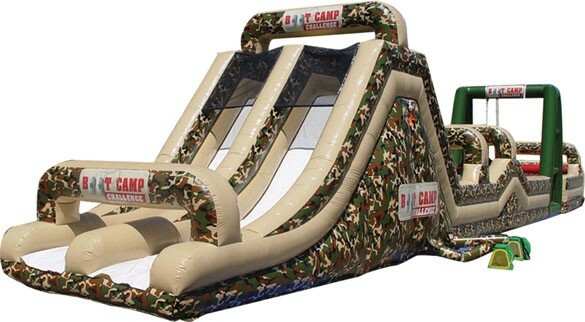 You still must face another obstacle before climbing your way to the top and sliding 20′ to victory! Dimensions: 85 ‘x 12′ x 16’, Weight: 1247 lbs.